Recently, the KinMall enterprise management platform and trading platform have been launched, officially helping partners to open their own exchanges, in order to achieve a win-win situation between exchanges, project parties, investors and sponsors, and jointly create a healthy blockchain ecosystem. According to the official website of KinMall, the first batch of exchanges that have successfully passed qualification examination and settled in KinMall platform includes 20 exchanges, including: Fintex, Acoin, Bmus, GWG, WanShare, CoinTop, Coinstar, and so on. More merchants will settle in the platform in the future, and users can now go to the KinMall platform for free trading. 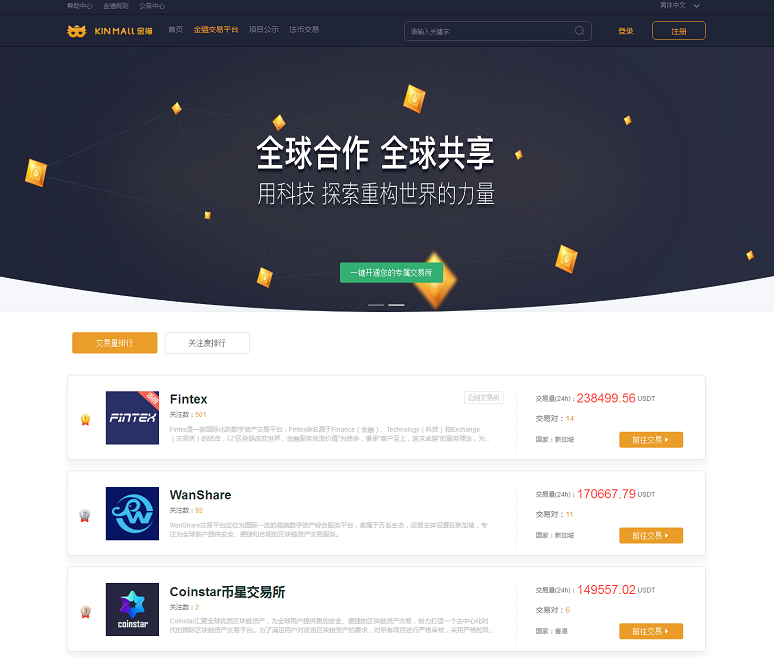 It is reported that Fintex is an international digital asset trading platform, providing investors with professional, safe and fair one-stop digital asset trading services. Acoin offers a variety of cryptocurrency transactions, including: BTC, ETH, LTC, TRX, XRP, BCH, etc., allowing users to enjoy one-stop trading experience. Bmus integrates an excellent operational team to provide a fair, secure and convenient digital asset trading platform for blockchain enthusiasts. GWG provides users with a safe and fair gaming experience through leading blockchain technology. The remaining 16 exchanges are professional digital asset trading platforms in the industry. The first 20 exchanges officially settled in the KinMall platform will achieve mutual benefit and win-win cooperation to jointly build the KinMall ecosystem. Under the bear market, the exchange’s anxiety about the traffic and depth became more and more obvious, the market competition became more intense, and the head exchanges’monopoly made the small exchanges’survival extremely hard. The “Tmall-style” trading platform model pioneered by KinMall brings hope to small exchanges, and everyone can open their own professional-level exchanges without any threshold. The first 20 exchanges can realize the profit by virtue of the technology, traffic, operation and ecology of KinMall, break the monopoly of the head exchanges, have their own management background, and decide which kind of tokens to go online. At the same time, these 20 professional exchanges are important partners of KinMall to create a “Tmall-style” trading platform with lower threshold, better service and greater liquidity. The two parties share in traffic, resources and users. Cooperate with each other, communicate regularly, share information, and work together to promote the development of KinMall and create a new paradigm for the blockchain industry, so as to attract more merchants, project parties and users to settle in KinMall platform, gradually improve the brand influence of exchange merchants and KinMall platform, and create a better, more convenient and safer digital asset service platform for users. It is reported that the KinMall platform is still in the trial operation stage, It always insists on putting the user experience first, and continuously optimizes and iterates the product to provide merchants and users with convenient, comprehensive, high-quality and secure digital asset management and trading experience. The head of the KinMall platform said that by the end of 2019, they will help 100 to 200 exchanges to gather at KinMall and work with their partners to create a world-class transaction aggregation platform. KinMall is the world’s first “Tmall-style” cloud trading platform, the world’s first aggregation platform of digital asset exchanges.